I bought this cardigan a few years ago and haven’t been sure of how to wear it. I love pink, but it’s tricky. For instance, I generally don’t like pink with black or grey, but I do like it with brown and khaki. I’ve tried wearing this cardigan with dresses but since most of my dresses are black or grey, I haven’t been enamored of the result. And then I had an idea: Instead of wearing it over a contrasting color, I should wear it over another shade of pink. 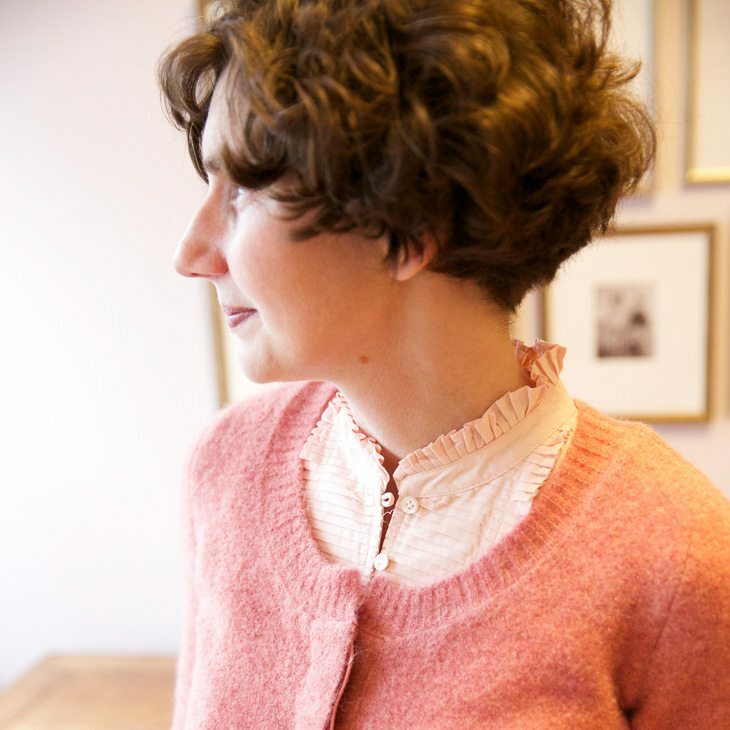 The workmanship in this cardigan is really lovely. The wool is shetland, but it’s lined with chiffon. That little ruffle peeking out of the bottom (which is a taupe-ish color) is part of the lining. And rather than buttons, it closes with over-sized snaps, which add a little graphic interest when the cardigan is open. Can you see the manifold attractions of this cardigan? I have two pink blouses — this one in crisp poplin and another in silk organza. I thought the poplin would work nicely with the lining of the sweater. This blouse has great details, too: a pleated bib, button loops and a squared-off, split hem. Love this! What a gorgeous sweater. And although I wouldn’t have thought of doing the skinny belt, it works so well there. Any thoughts for when (and for whom?) a belt over a blouse is a good idea? Thank you! I think a belt works well over a blouse that is not contoured to the body. This blouse is cut perfectly straight and made of a fairly stiff cotton poplin; unbelted, the middle almost bulges. So, a thin belt gives the blouse (and by extension, me) a little shape. I think that bit of shape is appreciable even under the sweater. If the blouse were contoured to the waist — either by construction (with darts or a bias cut) or fabrication (with soft jersey or silk) — a belt would be unnecessary.